It has been a wild week for many markets but will probably be remembered for the week European government markets were given permission to turn. With that Asian markets closing on a quiet note but ahead of US Non-Farms that was not a surprise. From its highs oil lost 10% at one stage and even now teeters on the brink after the EIA inventory report. The Nikkei continues to benefit from the back of a weaker Yen with dealers now talking when it will breach the 20k level again especially after today closing strong +1.5% ahead of US releases. European markets trade well ahead of the number with all core indices up around +0.5% for the morning session. Banking and finance sectors seem to be liking the recent bond market moves which are helping core indices across the geographies. Upon the release of the numbers we better but a slight mislead on them. Yes, it is good (+235k) but the wage rate was a little concerning – higher wages eventually but not yet; that was probably the message from the FED. Technology has clearly had an impact (2.8% for hourly earnings) but shows growth is stable and markets need to catch-up. 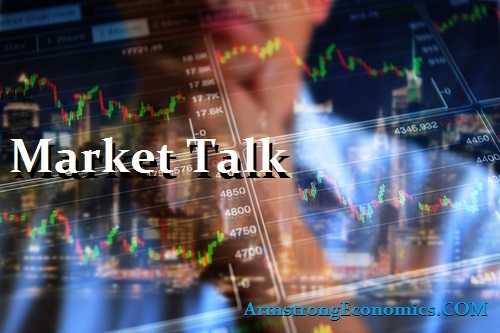 The DOW loved the move, Treasuries were not sure but eventually bounced off the lows (prices) but had suffered earlier in the week so now its down to looking at FED expectations. Dow lost a lot of the data move but remained positive ahead of the weekend and next weeks FED announcement. The expectations are now how aggressive and could it actually be more than 25bp but still three moves! Core European stocks closed the day positive but retreated from earlier highs. US gave back early gains but still managed a positive close. Certainly a big number had been priced in but only after Wednesday, following the ADP report. The market seems to be reluctant to accept that raising rates is because the economy is building but also is expanding because of increased capital flow. Once the market comes to terms with the increased in-flow, volumes will improve and confidence will build. Dow closes a shade firmer on the day but really has been quiet an emotional week for traders. The oil market closes near its lows and looks to be heading for further losses despite many claiming prices should bounce from current levels. 2’s closed 1.35% (-2bp), 10’s at 2.58% (-2bp), Bunds 0.485% (+5bp) closes the spread +210bp (-6bp the largest movement in over two months). France 1.11% (+4bp), Italy 2.34% (+4bp), Greece 7% (-1bp), Turkey 10.97% (-5bp), Portugal 4.01% (+3bp) and UK Gilts 1.23% (+1bp).